OPEC and crude producers meet in Algeria on Sunday to discuss their ongoing policy of limiting output to stabilize the oil market. President Trump took to Twitter on Thursday to criticize OPEC, alleging the cartel is trying to push oil prices higher. Saudi Arabia faces the challenge of pleasing its ally in Washington without upsetting an alliance of about two dozen producers by acting unilaterally. Saudi Energy Minister Khalid al-Falih and Russian Energy Minister Alexander Novak attend a news conference at the Ritz-Carlton hotel in Riyadh, Saudi Arabia February 14, 2018. Analysts don't expect Saudi Arabia and its allies to make a major policy decision at this weekend's meeting of oil- producing nations, but the Saudis face another challenge: appeasing President Donald Trump while keeping the kingdom's vision for a grand alliance of crude producers on track. Trump wants the Saudis to boost output to prevent oil prices from spiking as his administration restores sanctions on Iran, OPEC's third biggest producer and Riyadh's chief regional rival. If Saudi Arabia had any doubts about Trump's expectations, the president reminded OPEC in an early morning tweet on Thursday. @realDonaldTrump: We protect the countries of the Middle East, they would not be safe for very long without us, and yet they continue to push for higher and higher oil prices! We will remember. The OPEC monopoly must get prices down now! But Saudi Arabia faces threats to its leadership among roughly two dozen oil-producing nations if those countries perceive the kingdom is doing Washington's bidding at their expense. This weekend at a meeting in Algeria, the Saudis hope to advance their goal of making the ad hoc alliance — formed two years ago to end a devastating oil price downturn — more permanent ahead of its next major meeting in December. The 15-nation OPEC cartel and a group of other producers led by Russia have voluntarily throttled back their output since 2017 to boost oil prices. Now, the Saudis and OPEC want to institutionalize the alliance. "The Saudis do want to have as amicable a discussion as possible, and they want to prepare for the launch of this organization in December. That argues against rubbing new supply in Iran's face. They have a balancing act to strike," said Robert McNally, president and founder of Rapidan Energy Group. While kowtowing to Trump could raise questions about Saudi leadership, failing to send a clear signal to the mercurial U.S. president could put OPEC in Trump's crosshairs. This comes as Congress has revived legislation aimed at preventing OPEC from manipulating oil prices. Analysts say the Saudis are likely worried Trump will back the bipartisan legislation if OPEC crosses him, something presidents George W. Bush and Barack Obama refused to do. Trump first blamed OPEC for rising oil prices in April, renewing his position in June and July, even after producers restored some output in June. To be sure, production problems in some countries caused the alliance to cut output more deeply than it intended, helping to boost prices. But analysts say Trump's Iran policy is playing a major role in pushing crude back to 2014 highs in the $70 to $80 a barrel range. A news report on Tuesday that the Saudis are now comfortable with Brent crude oil prices above $80 a barrel may have prompted Trump's latest tweet. "I don't think the Saudis are at all comfortable with Brent above $80 because that gets President Trump on Twitter," said McNally. Raising output would also hurt many oil producers because few members of the alliance have much spare capacity. That means many would see their oil revenues shrink while a handful of producers like Saudi Arabia, Russia and the United Arab Emirates expand their market share. Analysts say the most likely course for OPEC this weekend is to reaffirm its current policy: slightly raising output to return to its target of keeping 1.8 million barrels a day off the market. The Saudis and Russians could then exert downward pressure on oil prices by stating they stand ready to meet any shortfall in supply. John Kilduff, founding partner at energy hedge fund Again Capital, doubts that will be enough to tame oil bulls. In his view, maintaining the status quo and failing to increase production will prompt more buying and higher oil prices. 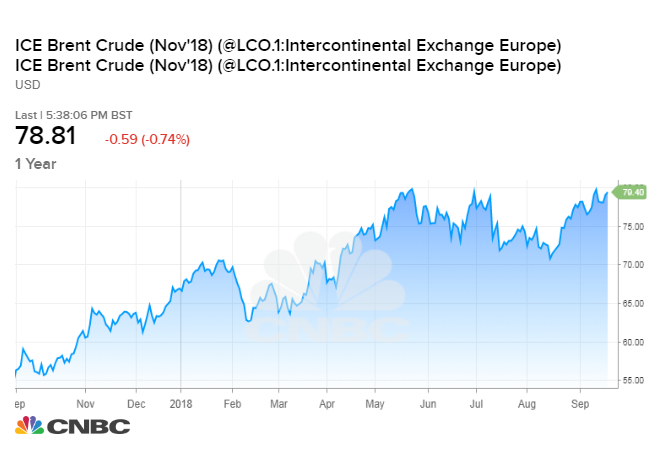 "Right now, the market is decently supplied, and so [OPEC members] are going to play with fire like they always do," he said. "Whatever comment they make will be bullish and we'll go higher in the short term." The seasonal drop in fuel demand at the end of summer will help to keep a lid on oil and gasoline prices, perhaps through the Nov. 6 congressional midterm elections, Kilduff said. However, Trump's deadline for oil buyers to stop importing Iranian barrels comes just two days before Americans go to the polls. Kilduff expects the impact of Trump's sanctions on Iran to become clearer in the weeks after the midterms. Once the elections are over, the administration may be willing to tolerate a higher price at the pump. "I believe they want to get these [Iranian] crude volumes down as much as they can, and I think they'll be willing to suffer a higher price for a while in the name of squaring away the Middle East," he said. Helima Croft, global head of commodity strategy at RBC Capital Markets, also thinks some corners of the market underappreciate how serious the Trump administration is about punishing Iran. The question of how much Iranian oil the Trump administration can take off the market is just one part of the equation, she says. In her view, the market is not focused enough on how Iran will respond. Iranian leaders have already threatened to disrupt oil shipments through the Strait of Hormuz, the world's busiest sea lane for crude exports. They could also ramp up their nuclear program or increase operations in foreign theaters like Yemen and Syria, Croft warns. That would inflame tensions in the region and likely increase the geopolitical risk premium baked into oil prices. While Saudi Arabia says it has roughly 2 million barrels a day of capacity it can tap, analysts say it's unlikely the kingdom would be able to bring that production online quickly and it would struggle to maintain that output. "That's where the whole timing of the Iran situation becomes important," Croft said. "Do we get a situation where the Iranian barrels come off and it takes time for the other producers to ramp up? Is that where you get this mismatch?" "I don't think there's a lot of shock absorbers for any other countries to come off. Libya needs to produce. Iraq can't have production problems in the south. There's really not a lot of margin for error given that Venezuela continues to have pronounced production problems." McNally is also skeptical of OPEC's ability to put out fires in a market where Iranian supply is under assault from U.S. sanctions, spare capacity is getting thin and production is tentative in several member nations. He compares spare capacity to fire trucks and OPEC to a city made of wood. "If all the fire trucks are out putting out the Iran fire, well that means there's no firetrucks left if the Libya building goes up or the Venezuela building goes up or the Iraq building goes up."